Hey look! 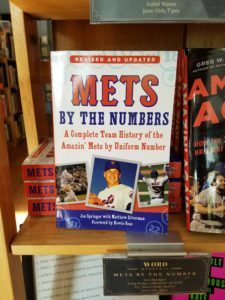 METS BY THE NUMBERS is here. It has been completely rewritten and re-engineered, including bios and data on more than 300 new players, with more minute details, a complete history of the uniform, new lists, new rankings, new photos, and more than 80 new pages. It’s hefty, and you can tell it’s an actual copy because David Wright appears on the cover instead of Dwight Gooden in the mockup you’ve seen until now. (Gooden instead appears on the spine, a nice touch). It officially launches tonight with an event at Word Books (126 Franklin St., Brooklyn) where I will discuss the project in conversation with NBC Sports’ D.J. Short and Greg Prince, author of the excellent AMAZIN AGAIN. We will have books for sale and signatures, plus free beer and Crackerjacks, starting at 7 p.m. Please join us! (Word is easy to find, 2 blocks from the Greenpoint Ave. stop on the G). 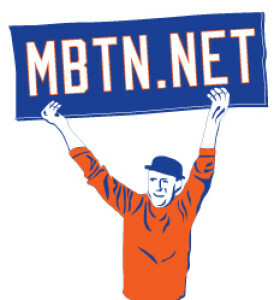 In Mets news, the club staggered to a disappointing series split in Milwaukee which saw still more of the team suffer aches and pains including manager Terry Collins (ill but thankfully appears OK), Neil Walker (bad back), Michael Conforto (wrist) and Jim Henderson (finger). Logan Verrett made a spot start then was sent down to Las Vegas and replaced by Erik Goeddel, who returned in No. 62. As noted, Kelly Johnson arrived and took over Ty Kelly’s No. 55. Newly arriving reliever Eric O’Flaherty is reportedly suiting up in No. 44 and as my pal Greg says, let’s hope he’s tougher on lefties than his predecessor in that jersey, the late John Mayberry Jr.
To make room for Flaherty, who was acquired last night for a Player To Be Named Later, the Mets designated Alex Torres and his gigantic hat for assignment, a move freeing up No. 54 for the next guy who wants it. In the meantime, keep your eye on the Mets’ starting rotation, which is expected at this time to slot in a 6th starter next time around. Speculation in the radio booth last night said it could be minor league teammates Dillon Gee and Logan Verrett competing for that — and next issue of No. 35. I’d guess at this point that Gee has the inside the inside track to the start, while Verrett, as a member of the 40-man roister, has a rightful claim on 35. But still it would weird to see Gee wearing 54. Baseball’s a funny game.